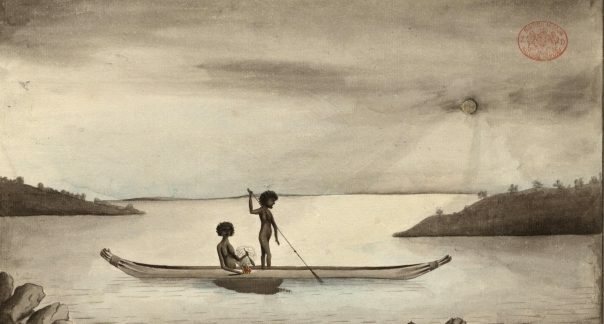 A NSW native striking fish by moonlight', by Port Jackson Painter 1788-1797 (BNHM). 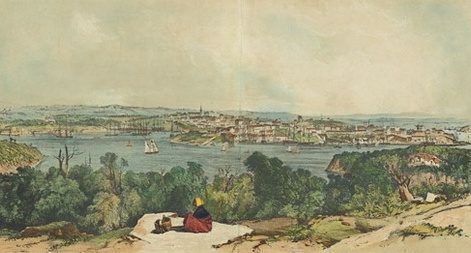 The city of Sydney from behind Lavender Bay, painted by John Skinner Prout in 1844. 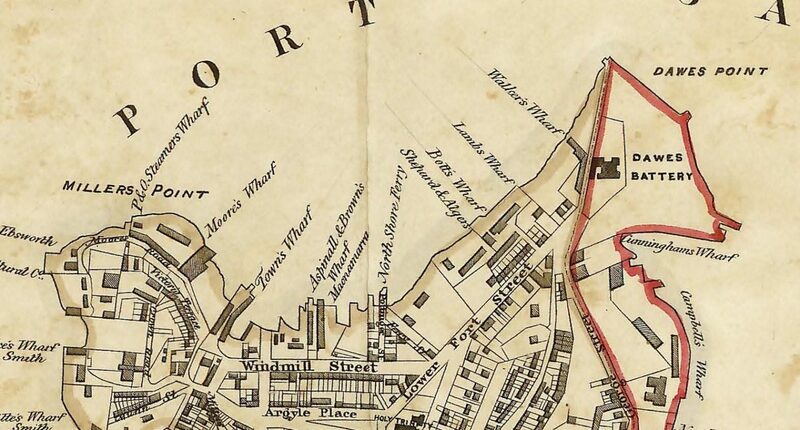 Woolcott and Clarke's 1854 map of Sydney (detail) showing mid-Victorian wharves (CoS). Postcard view of wharves along the Darling Harbour headland, c1900, the year of the rat crisis (CoS). 'Preparing for departure', a 1930s silver gelatin photograph by Harold Cazneaux (NLA). Large crowds were magnetised to the Pier One marketplace when it opened in 1982. Walsh Bay is the historic docks zone around the western headland of Sydney Cove; where British colonists anchored their First Fleet and founded the Port Jackson convict settlement in 1788. Originally occupied by Gadigal natives for camping, canoeing, cockle-gathering and spear-fishing, this area catalysed the bustling Darling Harbour cargo port during the 19th and 20th centuries. Since the early 1980s, Walsh Bay has led new cultural, commercial and residential renewals north-west of the city centre. The bay was first named in 1918 on drawings of a major new ‘wharfage scheme’ to modernise all Sydney’s docks to handle steamships and motor vehicles. The rejuvenation was planned by Henry Deane Walsh as engineer-in-chief of the Sydney Harbour Trust. Its then-chairman, Robert Rowan Purdon Hickson, lent his name to Hickson Road, the new freight thoroughfare around this headland. 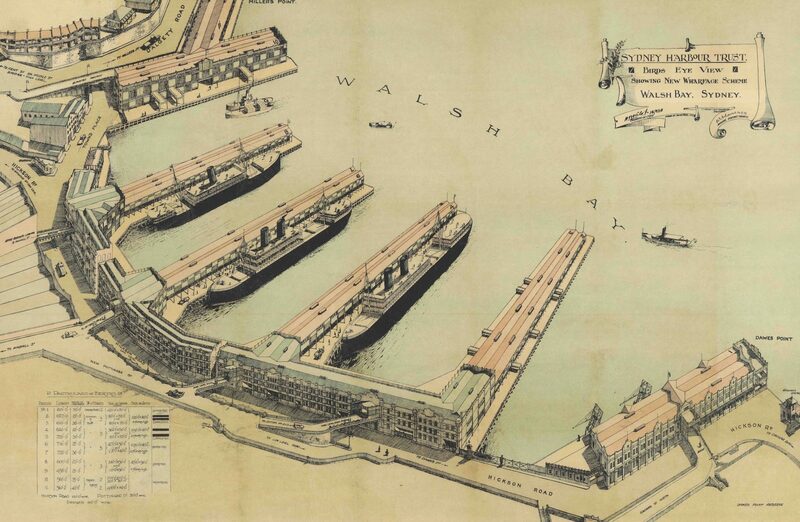 The Sydney Harbour Trust’s 1918 rendering of the Walsh Bay redevelopment (ANMM). 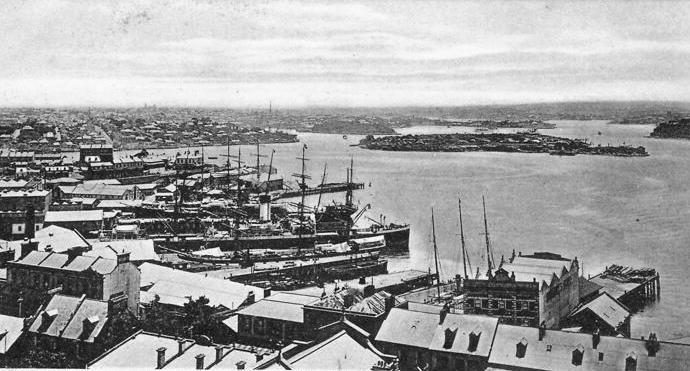 Walsh Bay’s development followed a deadly rat plague and government resumptions of land through The Rocks and Millers Point settlements in 1900-02. The new scheme, launched in 1913 and completed by 1925, comprised five piers (10 wharves) with timber-clad cargo sheds of one or two storeys; linked to brick-and-stone ‘shore sheds’ built on reclaimed land. These multi-storey warehouses were linked by bridges to more bond stores across Hickson Road (entered from Windmill Street, the original waterfront road uphill). 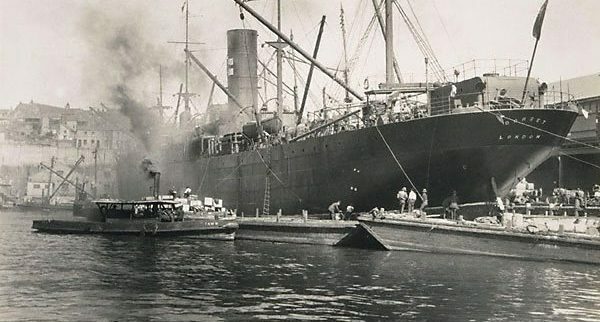 After 1925, the character and uses of Walsh Bay evolved from cargo to cruise shipping. During the inter-war decades of alcohol prohibition, organised crime and economic depression, Sydney newspapers regularly reported murders and late-night drownings at these wharves. From 1928 to 1932, the area was a major construction zone for the southern approach to the Sydney Harbour Bridge; then Hickson Road was repaved for motor traffic in 1933-34. 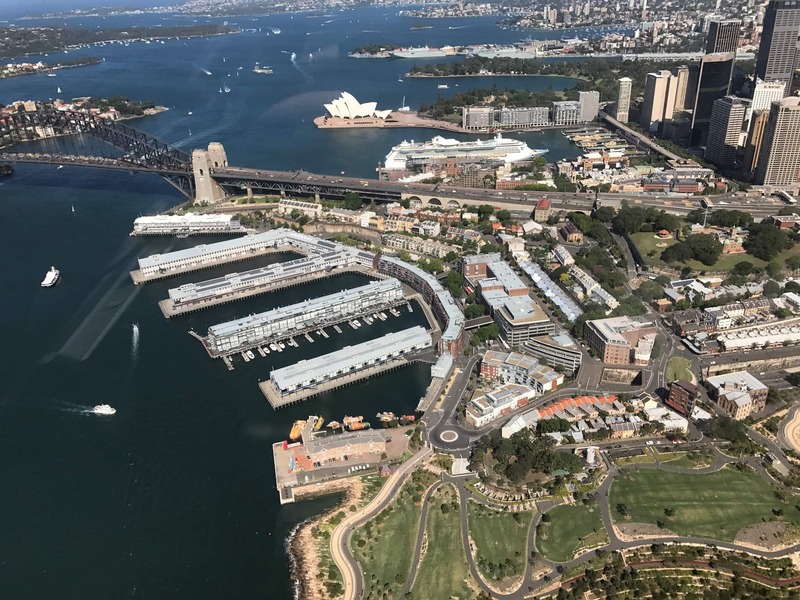 After the Second World War, the Walsh Bay wharves became an obsolete interchange—unsuitable for new modes of international transport, including container ships, large passenger liners and aeroplanes. In the 1970s, the warehouses were boarded up and neglected—then, during the 1980s and 1990s, some piers were popular for fire-torching stolen cars. First signs of a cultural renaissance came in 1982, when Pier One was converted by entrepreneurs to emulate the popular waterfront marketplaces of Boston and San Francisco. After several years of declining popularity, this wharf was converted for its current uses as a hotel and function centre. 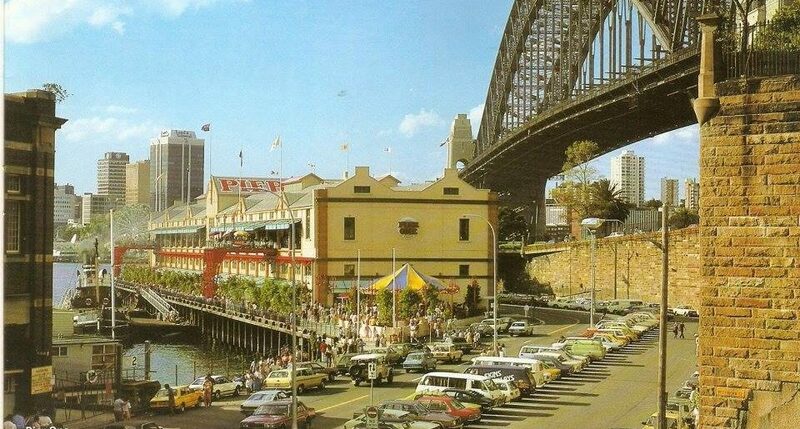 In the early 1980s, Pier 4-5 was renovated as a performing arts venue for the then-new Sydney Theatre Company, Sydney Dance Company and other troupes. Since the early 1990s, Pier 2-3 also has hosted private functions and public events like the Biennale of Sydney and the Sydney Writers Festival. Now the state government is upgrading these two wharves again, as a destination named the Walsh Bay Arts Precinct. During the mid-late 1990s, the NSW Maritime Services Board managed controversial negotiations with property developers to renovate Walsh Bay’s vacant buildings and sites for new residential, commercial and leisure uses. Several early schemes failed to gain support from heritage protection groups but a late 1990s concept, by French architect Philippe Robert, was completed by 2004 by an alliance with developers Mirvac and Transfield. Aerial view over Walsh Bay, Barangaroo Park and Millers Point, looking north-east c2015 (WBPA). Produced by Davina Jackson PhD (launched 2018). Initial research for the Walsh Bay Precinct Association. This site is archived with the National Library of Australia's PANDORA collection of significant e-resources.